Fast broadband Internet connections are common these days and downloading large emails to your email client software doesn’t take much time. However, there are times when you are stuck with a slow Internet connection and this can be an annoyance when you have an email with a really large attachment sitting on your email server waiting to be downloaded. 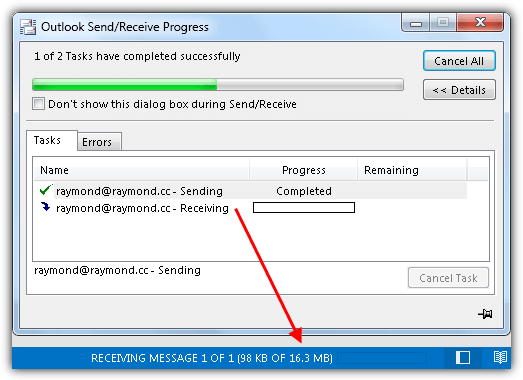 The problem with using an email client software to check your email is that all new emails are queued to be fully downloaded to your computer. This would mean that the email with a large attachment needs to be downloaded first before it can continue to download the next message. A simple solution to this problem is to manually delete that particular email or configure the email client software to only download the email headers when it is larger than the specified file size. Here we have 5 different ways on how to do it. 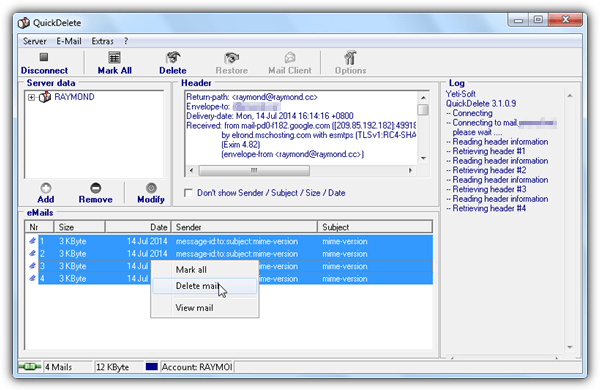 mail2web.com is a free online service that acts as a universal webmail for POP/IMAP emails. This is especially useful if your webmail is inaccessible or your emails can only be retrieved using POP/IMAP. All you need to do is enter your email address and password in mail2web.com and it will automatically try to figure out the correct mail server and port number to retrieve the emails and display it to you. To delete an email, simply tick the checkbox and press the “Delete selected emails” button. Next to the button you can find a link that says “Delete all emails in this folder” which is very useful if your email account is being mailbombed with thousands of junk mails and you can easily clean it up by clicking on that link. Similar to mail2web.com, Email.biz is another alternative that allows you to access any POP3 emails including the free webmails such as Gmail, Yahoo, Hotmail and etc. The design of Email.biz is much cleaner and modern if compared to mail2web.com but take note that it is still in beta while mail2web.com has been around since 1997 which makes it more reliable and trustworthy. Simply enter your complete email ID and password from Email.biz’s main page and click the Login button. We’ve tested logging in with a valid Hotmail and Gmail account but kept on receiving the error message “Invalid Password”. However POP3 email works fine. If you are uncomfortable in typing your POP3 email’s login information on third party website such as mail2web.com or email.biz mentioned above, here is a dedicated software called QuickDelete that can help you delete emails from your POP3 email account. QuickDelete is an old software released in 2003 that is still capable of deleting emails from your POP3 server without downloading them in advance like what most email client software would do. On the program, click the Add button to add your POP3 information and click Create. Then click Connect and enter your email password. Available emails will be listed at the bottom window which can be easily deleted by right clicking on the mail and select “Delete mail”. Although QuickDelete is free it requires a registration key which can be generated from their website for free. Fill up the user box with your name or anything containing only letters and numbers and click the Go button. You can actually use Telnet to connect to your POP3 email server and delete the email using the DELE command. Telnet is not enabled by default in Windows Vista, 7, 8 and can be turned on by pressing WIN+R, type optionalfeatures in the Run box and click OK. 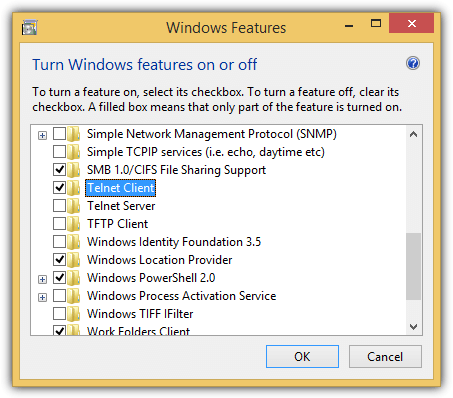 Select the checkbox for “Telnet Client” in the list and click OK.
a. To connect to your email server using Telnet, press WIN+R, type telnet mail.yourdomain.com 110 and click OK. You’ll need to replace mail.yourdomain.com with your mail incoming server and optionally change the port 110 to the one provided by your ISP. b. Next step is to provide the username by typing user yourusername@yourdomain.com. c. Then followed by your email password by typing pass yourpassword. If you’ve provided the correct username and password, you should see a message telling you that you’re “Logged in”. d. Type list to display all the email messages on the server. The screenshot below shows that there are 4 emails. e. To view the email content, type retr followed by the message number that is displayed when you used the list command. f. To delete the email that is corrupted or with a large attachment that you do not want your email client software to download, type dele followed by the message number. Example, dele 3 will delete the message number 3.
g. To disconnect, type quit and hit Enter key. Note: If you’ve accidentally marked the wrong email to be deleted, you can restore the deleted email by typing the rset command. Do note that when you use the dele command, the message is only marked for deletion. It is only after you quit the session the message will be permanently deleted from the server. 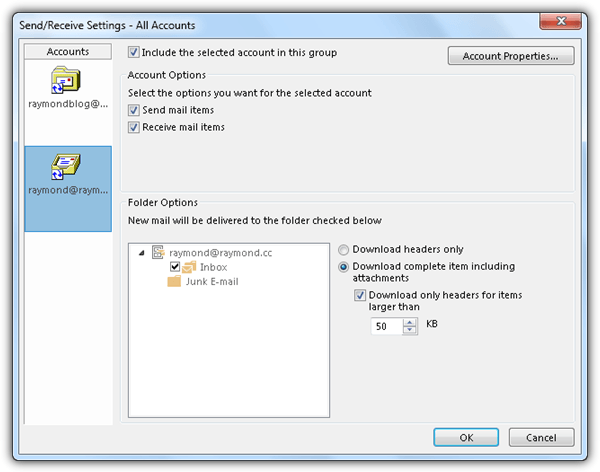 Email clients such as Outlook can be configured to only download the email headers if the item is larger than the specified size. To access the configuration, press Ctrl+Alt+S, select the Group Name and click Edit. Select the email account that you’d like to configure, tick the checkbox for “Download only headers for items larger than” and specify the size. Click OK when you’re done. This setting is permanent until you remove the configuration. 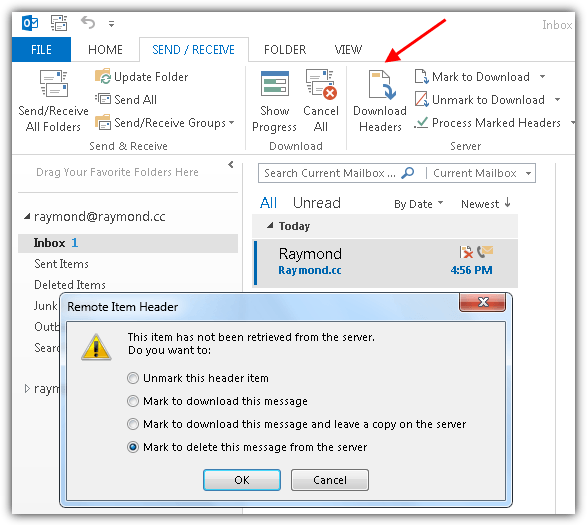 You can also manually force download the email headers in Outlook from SEND/RECEIVE > Download Headers. Double clicking on the email will give you the options to either download or delete it. I’ve used Ultrafunk’s Popcorn for years. Although it’s discontinued, you may still download it by Googling both popcorn and ultrafunk. It’s completely free and still works! Just be aware that the Ultrafunk website no longer has it for download. Get it from one of the other sites that Google shows in your search. Note that the last version of Popcorn was, and is, 1.99.3 and is dated August 2012.
haha thanks mate, may come in handy!